Spartan Aragon: Hello, New York & New Jersey! Hello, New York & New Jersey! 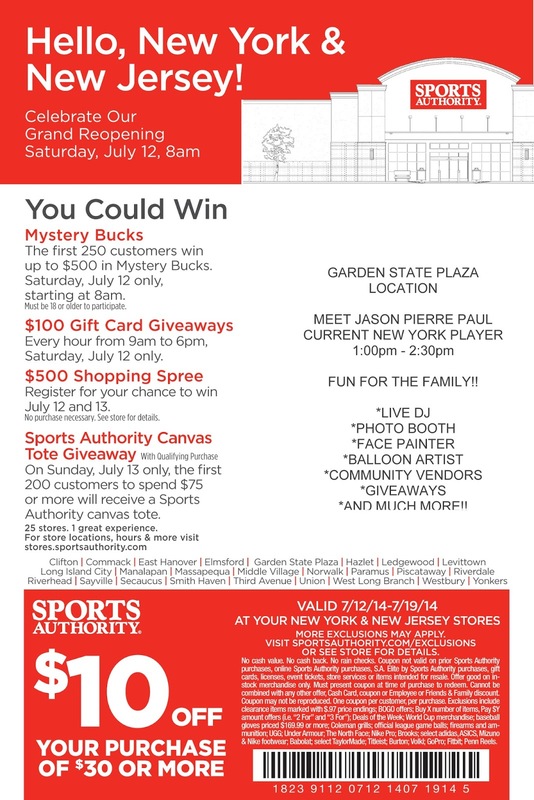 Sports Authority Paramus, NJ at the Garden State Plaza is having their Grand Reopening July 12, 2014 and you won’t want to miss it. The event begins at 8AM so get there early and enjoy some great prizes. The first 250 customers will have a chance to win up to $500 in mystery bucks, and everyone will have a chance to win $100 gift cards or even a $500 shopping spree. This is an event you will be able to enjoy with the entire family so don’t forget to bring the kids. Meet Jason Pierre Paul of the New York Giants, enjoy the live DJ, photo-booth, face-painting, balloon artist and more…See you there! Don’t forget to print the attached flier and enjoy a $10 off your order of $30 or more.